SOS Children's Villages International comprises 118 national SOS Children's Villages associations. As members of the federation, each SOS Children's Villages association is committed to applying the federation's statutes, standards for quality child care, and stringent financial and administrative practices. The General Assembly, which convenes every four years, is the highest decision-making body of the SOS Children's Villages federation. All member associations have the right to participate and vote in it. The General Assembly directs decisions relating to the federation's statutes and it elects the President and Vice-President, and other members of the International Senate. The International Senate consists of a maximum of 20 members, as well as the President and Vice-President. The term of office is four years. 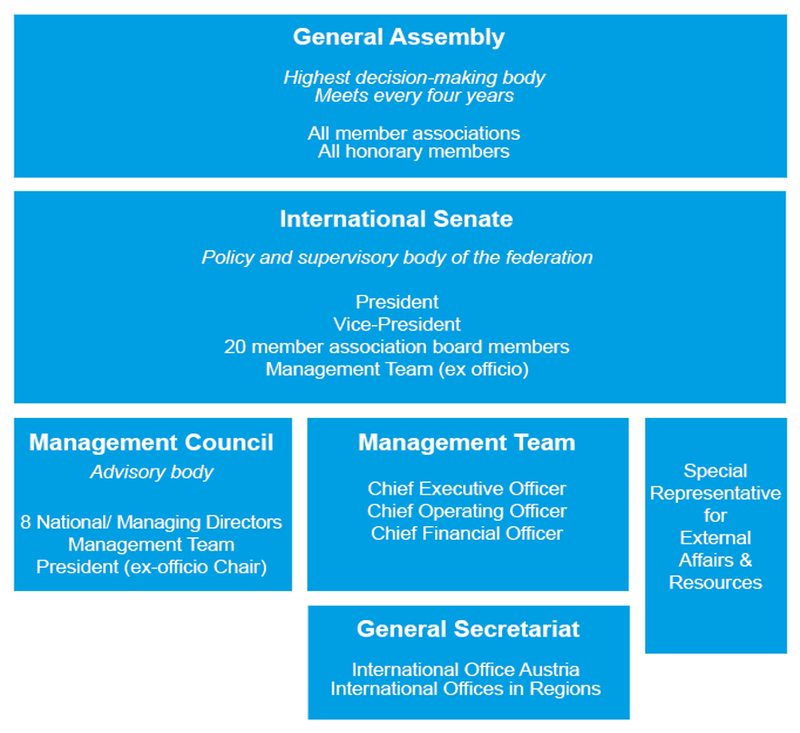 Eight seats are reserved for the member associations which make the largest financial contributions to the federation's international work. The International Senate's functions include formulating policy changes and drawing up procedural guidelines. The Management Council consists of the Management Team, as well as eight representatives from member associations, and is chaired by the President. Through exchange with all of the member associations, the Management Council makes recommendations for Senate decisions, approves work plans developed by the Management Team, and defines the federation's targets. The General Secretariat is led by the Management Team. It comprises the International Offices in Austria and in the regions, the International Competence Centres and Finance and Controlling. The General Secretariat is responsible for implementing strategic decisions taken by the General Assembly and the International Senate, developing and monitoring federation quality standards, and representing the federation in international communications and forums. The Special Representative for External Affairs and Resources is mandated by the International Senate and focuses on high-level liaison with select global organisations. This role represents the federation’s positions to international bodies such as the United Nations and the European Union, and supports and develops relationships with institutional and corporate donors and other potential partners at a global level. We are committed to protecting the environment so children all around the world can build their lives on a healthy and sustainable planet. Learn more: SOS Children's Villages Environmental Policy.